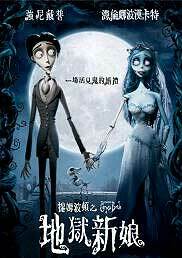 The cover for the DVD for Tim Burton’s Corpse Bride (Dìyù Xīnniáng / 地獄新娘 / “Hell Bride”) has what for me is an arresting usage: the roman letter “e” has been incorporated into a Chinese character. At first I thought this substitution of “e” for the 日 portion of the shì (是) phonetic element of 提 (tí) might be meant as playfully phonetic itself: “Teem” Burton, of sorts. So it was just a case of a designer having fun. The e has no phonetic function here. But there’s something else interesting about how Johnny Depp’s name is written. The first character, 強, takes more strokes to write in its so-called simplified form than in traditional Chinese characters. This entry was posted in Chinese characters, romanization, signage by Pinyin Info. Bookmark the permalink. I found another of the letter “e” appearing in Chinese characters. In this case it is a clever play on words. See a href=”http://davidonformosa.blogspot.com/2006/04/e-in-coffee.html”>my blog for a photo and explanation.